It's always a pleasure to be here sharing crochet patterns with you, because I love what I do. Every subject here is shared with affection and I know it is very useful for you, for practice and for the knowledge of you always increase. I am happy when many people come to thank me for having helped and managed to make incredible patterns through our website and I want it to continue like this, I have many projects and I know they will love. And I want more and more to grow this wonderful world of craftsmanship with crochet. It is a beautiful work that is done with the hands showing that we are able to make beautiful pieces and originals with our hands. With techniques, dedication and with that comes the practice. There are several things you can do with crochet, do not even count because our imagination helps a lot, sometimes we invent something that does not exist at all. Besides being a beautiful job, it has many benefits for those who practice it. So if you want to learn more about this world of crochet just read on. Come on. Everyone likes this kind of pattern so it's good to hit the present for someone dear. It never goes out of style and leaves the kitchen more delicate with these details. For all who are new to crochet, take advantage of this pattern because it is simple and quick to do. For those who sell their crochet work you should also have crochet cloth dishcloths in your store because you have enough of it. You can make this pattern on both the dish cloth and the towels you use on the table, it also looks beautiful. Another option is also to use on baby cloth, those cloths, and remembering that in this case it is important to pay attention to the type of crochet yarn that you will use as it should be of soft thickness. 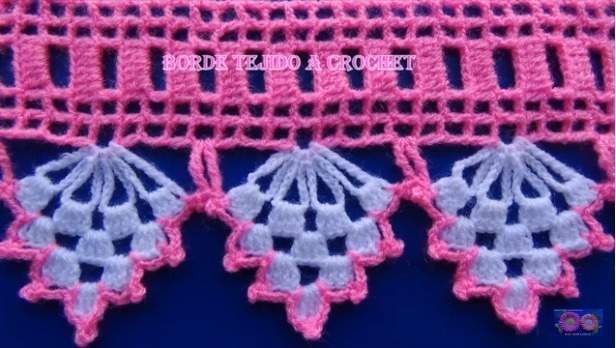 There are many patterns, ways to make the crochet bars in dish cloths and here I leave a template for you that is from the photo above that I left to see the final result. Make the color you prefer and depending on who you are, make color, two tones, light colors or even the strongest colors also look beautiful. If you liked this pattern do it right now, knowledge and practice is never too much. Create several pieces using crochet bars of various colors and you can also place to decorate more with beads, ribbons or appliqués as you prefer. Use your imagination and create beautiful pieces. I leave the video tutorial below to help make this beautiful pattern, change the language in the caption if you need to. Enjoy our Xell Crafts facebook page and follow our news.